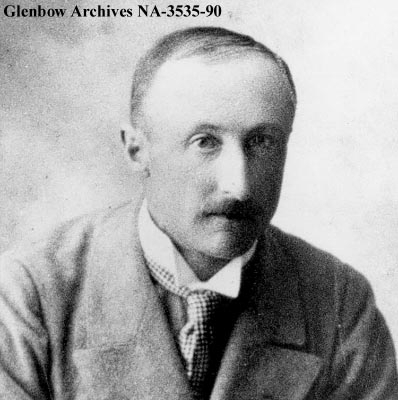 In 1909, Premier Rutherford of Alberta announced a program of vast railway expansion in the province, offering bond guarantees to major railway companies to build branch lines in districts where they seemed warranted. The railway company to undertake the greatest extent of track as a result of this was the Canadian Northern, which had arrived in Edmonton directly from the east in 1908, and was soon to extend its track north to Sangudo and Athabasca and west into British Columbia. Other Canadian Northern lines were built in the southern part of the province. One of the more significant of these was between Stettler and Camrose, and was completed in 1911, opening up new farmland for settlement. As was its practice, the Canadian Northern erected stations at key points along the line, and, in some cases, townsites were subdivided. This was the case with Meeting Creek, which was located in a district that had already been settled, largely by farmers from the United States. When the railway came through, the tiny community, established in 1905, was moved five miles to be included in the new townsite. Being less than 18km from the larger farming centers of Donalda and Bashaw, and 30km away from Camrose, Meeting Creek never grew to sufficient size to be incorporated. It did, however, possess most of the amenities of a prairie farming community, including stores, garages, livery stables, a blacksmith shop, a bank, a hotel, and, eventually, three grain elevators. It also had a small, but busy, railway station, constructed in 1913. This was a two-story structure with a warehouse attached. It was subdivided into an office, waiting room, freight house, and living quarters for the station agent and his family. Life in the community of Meeting Creek evolved around the businesses along Main Street, which ran perpendicular to the station, and the station itself. All passengers and incoming and outgoing freight were handled by the station agent, including the export of grain. The agent was also the district telegrapher. When the Canadian Northern was merged with the Grand Trunk Pacific Railway in 1919 to form Canadian National, many small branch lines were closed down in Alberta, but the Camrose – Stettler line remained open, as sufficient agricultural products were being shipped out from the district in between to warrant this. By the 1960’s, however, improved highway traffic saw the closure of train service in Meeting Creek, although the Camrose – Stettler branch line would remain operating until 1997. 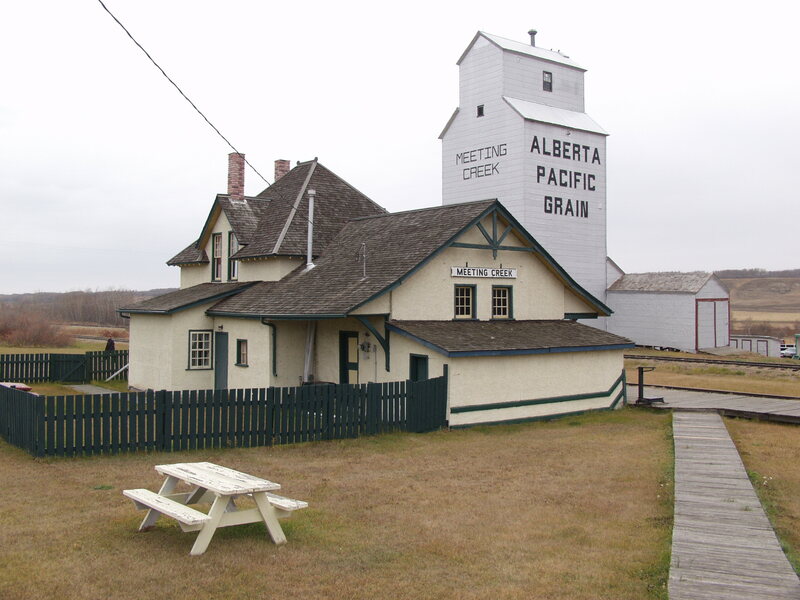 Being that there was little development in Meeting Creek in the years after the railway station was closed, the structure managed to survive, along with the Alberta Pacific Grain Elevator, and, in 2008, it was designated a Provincial Historic Resource. Today it is an integral part of the Canadian Northern Society’s tour of significant rail sites. Visit the Alberta Register of Historic Places to learn more about the heritage value of the Canadian Northern Railway Station in Meeting Creek. In order for a site to be designated a Provincial Historic Resource, it must possess province-wide significance for either its history or architecture. To properly assess the historic importance of a resource, a historian crafts a context document that situates a resource within its time and place and compares it to similar resources in other parts of the province. This allows staff to determine the importance of a resource to a particular theme, time, and place. Above, is some of the historical information used in the evaluation of the Meeting Creek railway station. Yellowhead County, a large rural municipality west of Edmonton that stretches between the Pembina River in the east all the way to the Jasper National Park gates in the west, is currently embarking upon a Municipal Heritage Survey. 1) Under the Municipal Heritage Partnership Program (MHPP) Yellowhead County has received cost-shared funding. All municipalities in Alberta are eligible to apply for cost-shared funding to assist in the completion of a Municipal Heritage Survey, Municipal Heritage Inventory and/or a Municipal Heritage Management Plan. These projects are designed to assist with the identification, evaluation and management of historic places. Municipalities throughout Alberta have participated in MHPP and learned about the rich historic resources that make their communities unique and livable. 2) Yellowhead County staff, combined with the services of a heritage consultant and the participation of area residents, will complete the Municipal Heritage Survey. The survey will systematically document resources through photographs and record geographical information, design features and construction and historical information. advise Council on proposed Municipal Historic Resource designations. 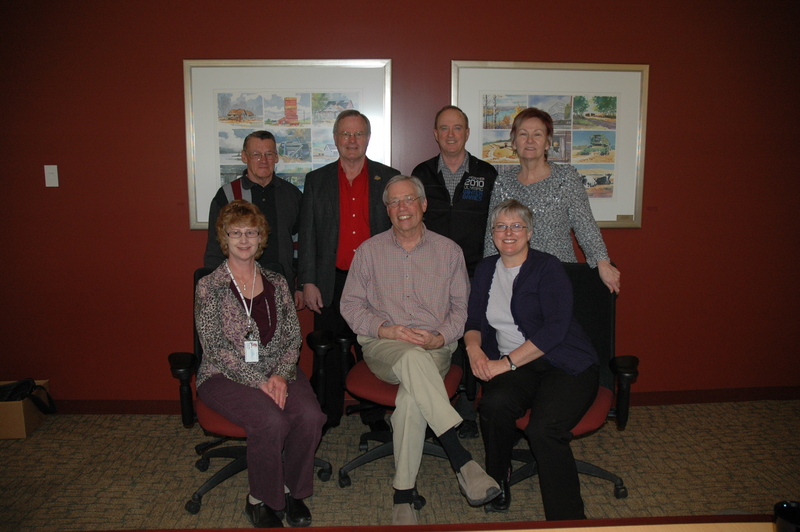 This committed group of volunteers has the important job of providing public input and expertise to Council so that informed decisions about Yellowhead County’s heritage can impact current residents and future generations. Back L-R: Gary Conger, Shawn Berry, Brian Broughton, Pat DiMarcello. Front L-R: Cheryl May (Heritage Coordinator), Marshall Hoke (Chair), Debbie Charest (Director of Community and Protective Services). Do you have questions about how your municipality can participate in the Municipal Heritage Partnership Program? Contact program staff to learn more. Rutherford House is 100 Years Old! …and you are invited to help celebrate! On Sunday, June 5, 2011 (12:00pm to 4:00pm) staff of Rutherford House Provincial Historic Site will host a celebration to mark this milestone. All are welcome to attend – a traditional Founder’s Day Tea Party along with parlour music, a family craft, a history display and tours of the home will surely entertain. Rutherford House, located in Edmonton on the grounds of the University of Alberta, was built in 1911 as the home of Alberta’s first premier, Dr. Alexander Cameron Rutherford. The house was designated as a Provincial Historic Resource in 1979 by the Government of Alberta and currently operates as an interpreted Provincial Historic Site. To learn more about Rutherford House Provincial Historic Site, click here. To read about the heritage significance of Rutherford House and why it was designated a Provincial Historic Resource, click here. Did you know that a special Alberta community is celebrating its sesquicentennial this year? For that matter, do you know what a sesquicentennial is? It’s a 150 year anniversary and the City of St. Albert is marking that major milestone in 2011. At the heart of the celebrations is the Father Lacombe Church situated on Mission Hill. 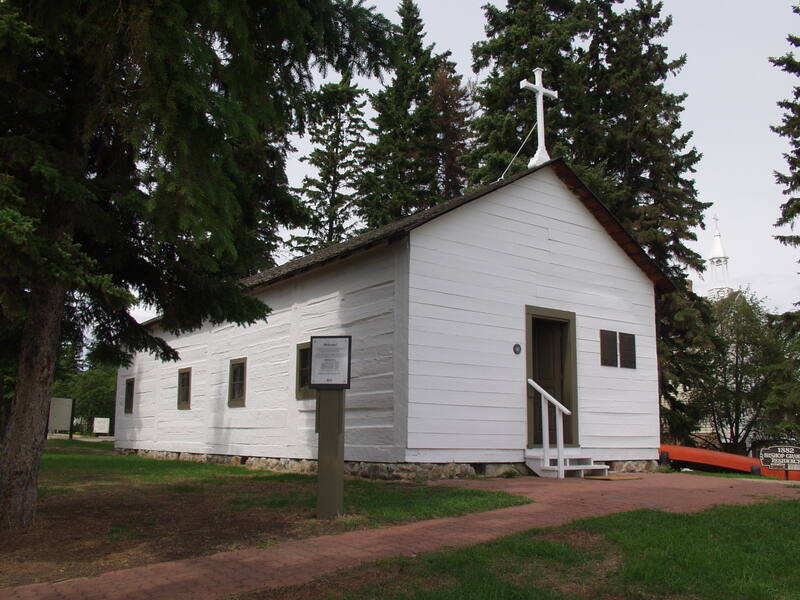 Erected in 1861, the church is the oldest extant building in Alberta and embodies the community’s early history as a Roman Catholic mission. From those humble beginnings, St. Albert developed into one of the largest settlements between Red River and Vancouver. Today, it’s a vibrant, prosperous city. Learn more about this site and other historic places in St. Albert by visiting the Alberta Register of Historic Places and searching for “St. Albert” under the Municipality advanced search option. The name Skrine Creek has been officially adopted for a previously unnamed creek in the Porcupine Hills. The name commemorates Walter and Agnes “Nesta” Skrine (pronounced “screen”), who were early operators of a medium-sized ranch in the region. The spring-fed creek rises in the Municipal District of Ranchland No. 66 and flows northerly into the Municipal District of Willow Creek, where it joins Mosquito Creek approximately 24 kilometres west of Nanton. Walter Skrine was born in Somerset England in 1860. After receiving his education at Oxford University, he managed a coffee plantation in Ceylon until the early 1880s. In either 1883 or 1884, he to migrated to the Canadian northwest, where he began ranching along the Highwood River in the “Pekisko Hills” (Little Rolling Hills) region. After losing most of his cattle during the disastrous winter of 1886/87, he moved further west and established a ranch on Mosquito Creek. He chose the site due to the protection offered by the surrounding hills and the plentiful water supplied by the area’s creeks and springs. He settled first as a squatter, but later filed on a 160-acre homestead and leased nearly 16,000 acres of surrounding land. Starting with 200 head of cattle, he grew the herd to 700 head by 1898. Walter was active socially and politically within the ranching community. He ran, unsuccessfully, for the Territorial Assembly and, in 1885, the North-West Stock Association, a protest movement against the policies of the existing territorial stock association, was formed during a meeting at Skrine’s house in 1885. In 1895, Walter travelled to Ireland where he married Agnes “Nesta” Shakespeare Higginson of County Antrim. Walter and Nesta travelled back to Canada, where she took an active role in the daily activities of the ranch. Nesta was a very well-educated young woman and a talented writer and poet. She was published throughout Europe, mainly in Blackwood’s Magazine, under the pseudonym Moira O’Neill. 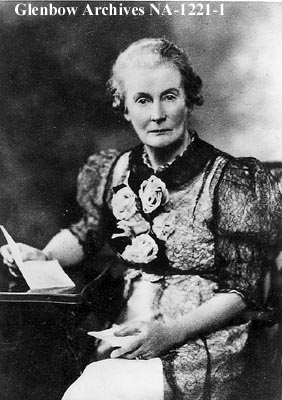 She also published a short novel, The Elf-Errant (1895) and two books of poetry, Songs of the Glens Antrim (1900) and More Songs of the Glens of Antrim (1920). Ranching life and the landscape of the Canadian West provided inspiration for much of her prose and poetry, notably a prose piece entitled “A Lady’s Life on a Ranche,” which has been republished in many anthologies about southern Alberta ranching history, and a number of poems in both of her published books. Unlike many of their fellow ranchers, the Skrine’s welcomed the arrival of farmers into the region and assisted many of them in establishing themselves. However, the transition of the local economy from ranching to farming put pressures on many ranchers. In 1902, Walter and Nesta sold the Bar S Ranch to a neighbour and returned to Ireland. They settled at Ballyrankin House in County Wexford. In 1921, the house was burned by Irish patriots, one of many such attacks on English gentry during “The Troubles.” Undaunted, the Skrines, purchased the Newlands House, about a mile away and re-christened it as Ballyrankin House. Walter Skrine died here in 1930 following a hunting accident. Nesta Skrine died on January 22, 1955. As of 2011, the Bar S Ranch continues to operate on the same land originally selected by Walter Skrine in the 1880s. The proposal to name this water feature Skrine Creek was received from Clay Chattaway, the current owner/operator of the Bar S Ranch in September 2009. The proposed name was supported by both Municipal Districts, the surrounding land-owners and descendants of the Skrine family living in Ireland. The proposed name received the approval of the Alberta Historical Resources Foundation in November 2010 and the Minister of Culture and Community Spirit in February 2011. Click here for a full view of Aerial Imagery of the Region Around Skrine Creek. Description: Rises in the MD of Ranchland No. 66 and flows north into the MD Willow Creek No. 6. The creek flows northerly into Mosquito Creek, approximately 24 km WSW of Nanton. Skrine, Agnes, “A Lady’s Life on a Ranche,” In A Flannel Shirt and Liberty: British Emigrant Gentlewomen in the Canadian West, 1880-1914, edited by Susan Jackel, 95-110. Vancouver: University of British Columbia Press, 1982. Originally published in Blackwood’s Edinburgh Magazine vol. 163 no. 987 (January 1898). Higginson, T. B. “Moira O’Neill in Alberta,” Alberta Historical Review vol. 5 no. 2 (Spring 1957): 22-25. Klassen, Henry. “A Century of Ranching at the Rocking P and the Bar S.” In Cowboys, Ranchers and the Cattle Business: Cross-Border Perspectives on Ranching History, edited by Simon Evans, Sarah Carter and Bill Yeo, 101-122. Calgary: University of Calgary Press and Boulder: University Press of Colorado, 2000. 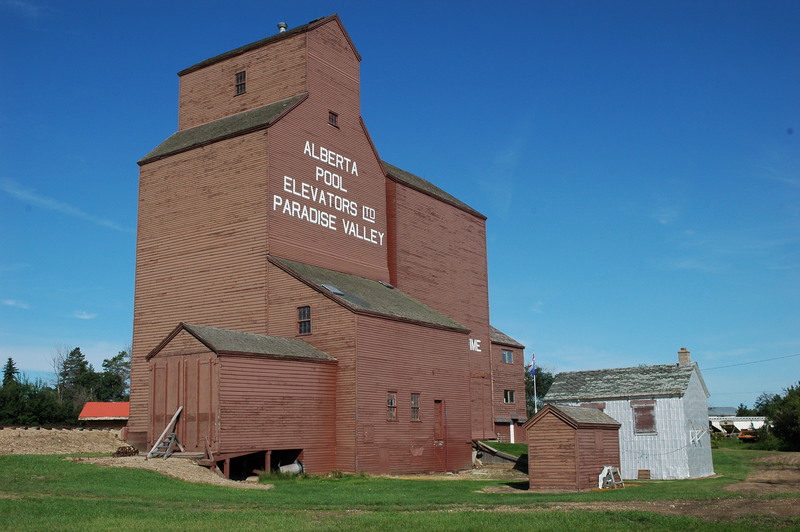 The Alberta Wheat Pool Grain Elevator in Paradise Valley was designated a Provincial Historic Resource in 2008. In order for a site to be designated a Provincial Historic Resource, it must possess province-wide significance for either its history or architecture. To properly assess the historic importance of a resource, a historian crafts a context document that situates a resource within its time and place and compares it to similar resources in other parts of the province. This allows staff to determine the importance of a resource to a particular theme, time, and place. Below is some of the historical information used in the evaluation of the Alberta Wheat Pool Grain Elevator. When members of the Barr Colony settled in what would become the Lloydminster district at the turn of the 20th century, they were soon served by the Canadian Northern Railway, which arrived in 1904. With this, the farming district quickly expanded. One of the areas to be flooded with homesteaders was located just southwest of Lake Bricker, in a district to be named Paradise Valley by a promoter with the California Land Company named Frank Henton. The first settlers began to take up land in 1906, and in 1910 a store and post office was opened by Kenneth Gunn on SE30 TP46 R2 W4. Schools and churches soon followed in the district, although the main commercial centers remained Kitscoty and Lloydminster, some 20 km to the north and northeast. Like much of rural Alberta, the Paradise Valley district prospered during the World War I years but suffered a recession at war’s end, with the overproduction of grain causing international prices to fall. Then, with the Locarno Pacts opening up markets in Europe, the demand for western Canadian grain began to rise. When coupled with high yields, this brought prosperity to the district during the late 1920s. 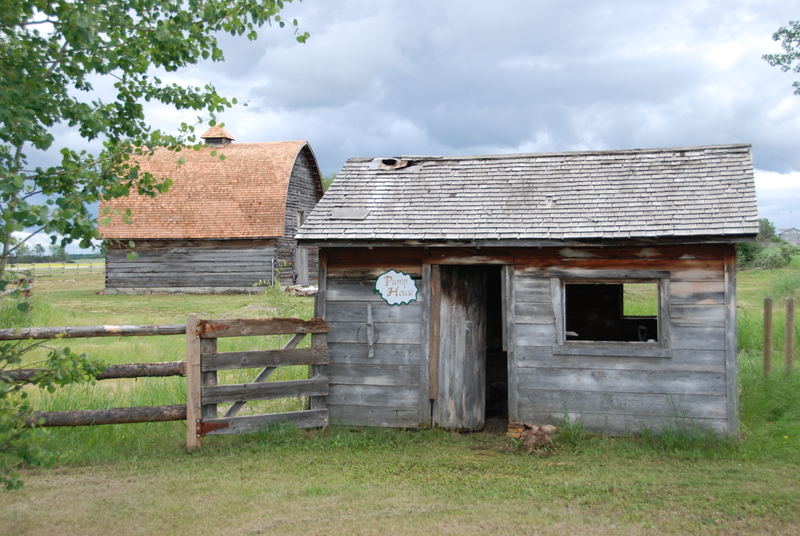 The McNaught Homestead near Beaverlodge was designated a Provincial Historic Resource in 2003. In order for a site to be designated a Provincial Historic Resource, it must possess province-wide significance for either its history or architecture. To properly assess the historic importance of a resource, a historian crafts a context document that situates a resource within its time and place and compares it to similar resources in other parts of the province. This allows staff to determine the importance of a resource to a particular theme, time, and place. Below is some of the historical information used in the evaluation of the McNaught Homestead. 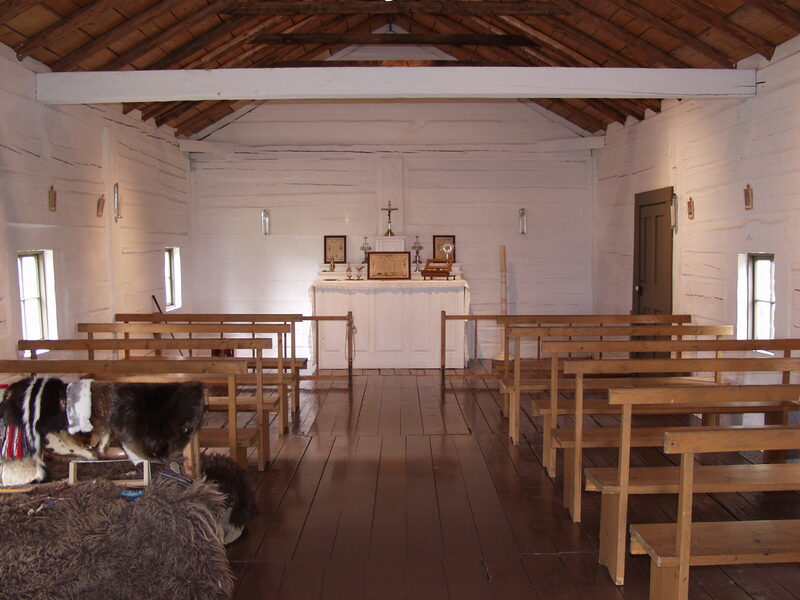 In the spring of 1909, a group of excommunicated Methodists from Ontario known as the Christian Association (or Burnsites after their leader, Nelson Burns) made their way in convoy to the western edge of the Grande Prairie in northwestern Alberta and began to carve out homesteads. The district along the lower Beaverlodge River was just being surveyed, and this group of 31 settlers came to constitute what would become the first successful attempt at group settlement in the Peace River Country. They were soon joined by other settlers from Ontario, some of them Christian Association members, some not. Among the latter was Charles McNaught who, with his wife Eliza, arrived in the district in June, 1911 to visit his brother, Sam, who had settled in the area two years earlier. Taken by the country, Charles and Eliza also decided to try establishing a farm there, taking two quarter-sections of land off the Beaverlodge River on NE15 and SE22 TP71 R10 W6 with half-breed scrip, and one on NE25 TP70 R11 off the Red Willow River by homesteading. They decided to reside on NE15, and so they constructed a log dwelling, a barn, and other structures, and proceeded to work the land. In 1914, they received title to both NE15 and SE22.